This year's festival drew 192 people to the Bill Bordy theater. Student volunteers help serve food. Mediterranean fare from Boston Kebab house disappeared quickly. Indian sauces added spice to the event. Students gathered in the Bill Bordy around small tables and sat on the floor. A long line spilled out the door. The earthy smell of falafel wafted through the air, mixing with the fishy scent of sushi. 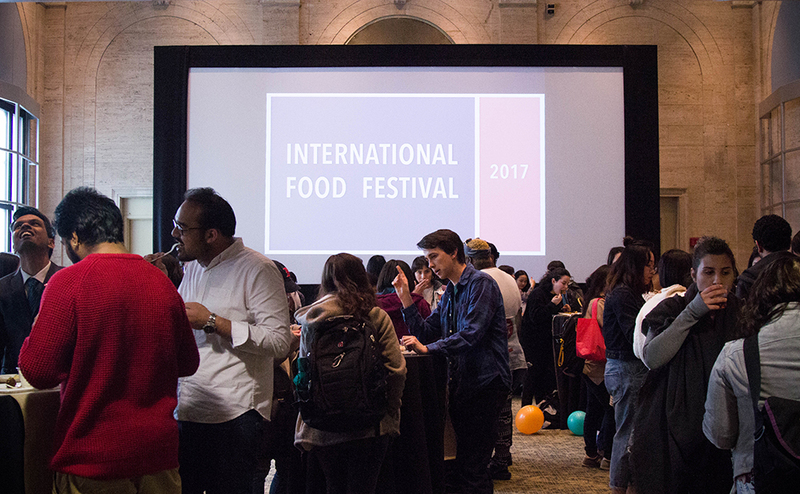 Members of the Emerson community filled the theater, not looking for a film or a play, but instead looking to travel the world’s kitchens. This was the scene at Emerson’s Annual International Food Festival. The event, now in its second year, was spearheaded by the Office of Internationalization and Global Engagement in response to a survey of the college’s international student population two years ago. The survey was conducted in an effort to gauge the international student experience at Emerson from both an academic and a social perspective. The results of the survey showed that the students from outside the United States had concerns that the Emerson community lacked an understanding of unique international cultures, according to Susannah Marcucci, a program coordinator from the Office of Internationalization and Global Engagement. The festival was then devised as way to increase cultural competency in a fun, informal way. “We designed this event as a way to have something for the whole community to showcase that part of the population,” Marcucci said. Marcucci’s office worked in conjunction with organizations on campus to bring the event to life. Emerson’s Asian Students for Intercultural Awareness (ASIA), Emerson’s Black Organization for Natural Interests (EBONI), Emerson’s Alliance for Gays, Lesbians, and Everyone (EAGLE), and offices like Intercultural Student affairs, Diversity and Inclusion, and more sponsored the event. Members of these organizations served a variety of food to the packed theater. 192 people checked in with their Emerson ID’s, and 20 people volunteered, according to Marcucci. Japanese, Middle-Eastern, Afro-Caribbean, Italian, and Indian cuisines were all available for free to the attendees. The food was bought from local restaurants like Fin’s Sushi, Boston Kebab House, and New Shanghai with funds from the budgets of each sponsor organization and office. “I wasn’t sure what the turnout was going to be…I didn’t realize this many people would show up. We got a great turnout,” said Mona Moriya, a senior performing arts major and the president of ASIA. The attendance for this year’s event surpassed the initial festival last year, Marcucci said. Only a half hour after the event began, the hosts ran out of plates and Marcucci had to make an emergency stop at CVS to buy more.